Generic and specialty pharmaceuticals company Mylan reported a 41.4% plunge in its fourth quarter earnings to $244.3 million, impacted by the recognition of a tax benefit in the prior year of $192.6 million as compared to tax expense in the current period of $82.8 million, including the provisional impact of $128.6 million related to the enactment of the Tax Cuts and Jobs Act of 2017. 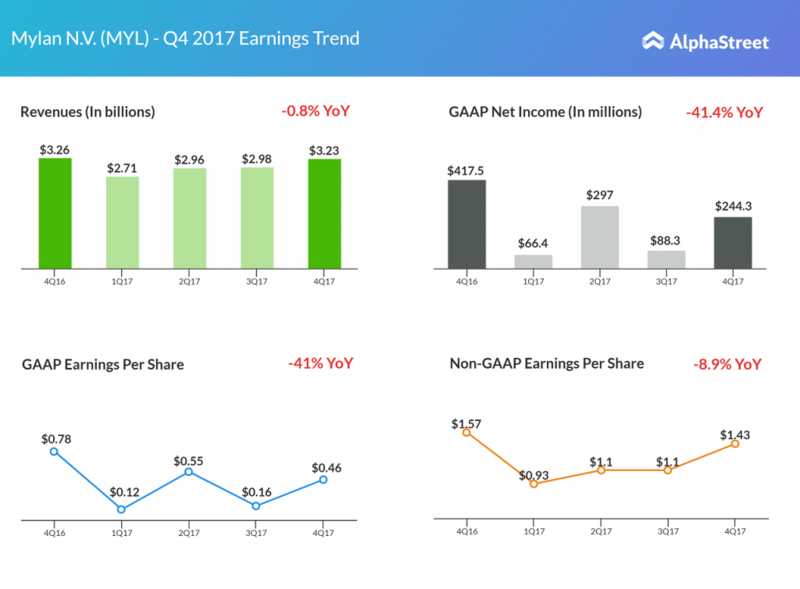 Adjusted earnings per share declined 8.9% to $1.43 from $1.57 in the same period in 2016. Revenue declined marginally by 0.8% to $3.23 billion from $3.26 billion a year earlier. North American third party net sales declined 17%, while excluding the decline in sales of the EpiPen, this segment slid 8%. However, Europe segment third party net sales jumped 16% to $1.07 billion. For 2018, Mylan expects total revenue in the range of $11.75 billion to $13.25 billion. Adjusted EPS is expected to be in the range of $5.20 to $5.60, the midpoint of which represents an increase of 18% versus 2017.